The rehabilitation of British music began with Hubert Parry and Charles Villiers Stanford. Ralph Vaughan Williams assisted in its emancipation from continental models, while Gerald Finzi, Edmund Rubbra and George Dyson flourished in its independence. 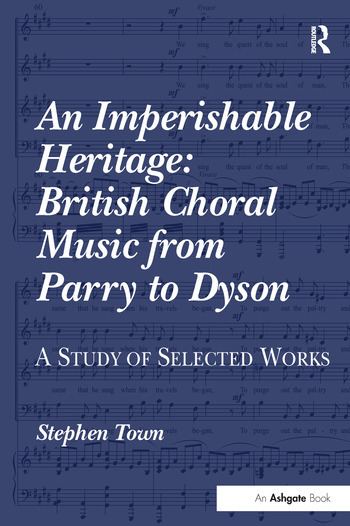 Stephen Town's survey of Choral Music of the English Musical Renaissance is rooted in close examination of selected works from these composers. Town collates the substantial secondary literature on these composers, and brings to bear his own study of the autograph manuscripts. The latter form an unparalleled record of compositional process and shed new light on the compositions as they have come down to us in their published and recorded form. This close study of the sources allows Town to identify for the first time instances of similarity and imitation, continuities and connections between the works. Stephen Town is Professor of Music at Northwest Missouri State University. He is a recipient of the Ralph Vaughan Williams Fellowship and has published widely on music from the eighteenth to the twentieth centuries.